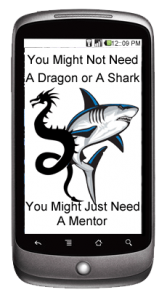 You Don't Need a Dragon or a Shark – You May Just Need a Mentor! You Don’t Need a Dragon or a Shark – You May Just Need a Mentor! Entrepreneurs and small business owners looking to grow their new or existing businesses will sometimes appear on popular TV shows like Dragon’s Den or Shark Tank to pitch their ideas to millionaire investors. While some of the people who appear on the show truly need the financial help and the clout they get by partnering with one of these dragons or sharks, others do not. They may just need a mentor. It is no secret that starting a small business can seem to be quite a lonely endeavour, but it does not have to be. The new challenges and hurdles that even experienced entrepreneurs will face in a new business venture can be just as difficult as the ones they faced in their first business venture. This is why finding a mentor can be the key to getting past the “fake it until you make it” stage. Mentorship is not a recent practice. It is believed that the concept of mentoring originated in ancient Greece in Homer’s Odyssey. It was in the latter part of the 20th Century that mentorship really began to spread in North America – mainly in training in the arts and skilled crafts. Eventually, it was adopted by businesses to educate young management executives using older and more experienced executives. Yet, it was not until the mid-1990s that the term “mentor” had become part of everyday speech. These days mentoring does not require a direct company relationship between the mentor and the protégé. There are some instances where the mentor and protégé do not even work in the same business or industry. An accountant working in the auto industry may choose to mentor a new accountant in the paper industry. The idea is that the more experienced mentors are willing to help someone with less experience to further themselves. It is also not uncommon for an entrepreneur in the same industry to mentor a protégé entrepreneur who is just entering that industry. Mentoring relationships can be established through a structured formal program or an informal introduction through business connections and/or networking events. Structured programs are usually set up by government, NGO’s, chambers of commerce or business associations. These programs typically range from a minimum of six months to two years. An informal mentorship is usually set up through an introduction from business connections and industry and networking events, as well as personal approaches. These relationships can be as short as a few phone calls and coffee meetings, or as long as a lifetime friendship. One of our VoIP virtual office clients (who rents out one of our training rooms every few months at a reduced client rate) conducts seminars about mentorship. She tells people looking to find a mentor to be well prepared before the initial meeting. She also suggests creating a list of questions, opportunities and challenges to address, before sitting down for the initial meeting. She reminds them to respect and understand the mentor’s expertise and realize that he or she will not have all of the answers. The most important thing she tells people is to remember that the role of the mentor is to ask the potential protégé questions and prod them to uncover answers. Is Your Small Business White and Gold or Blue and Black?